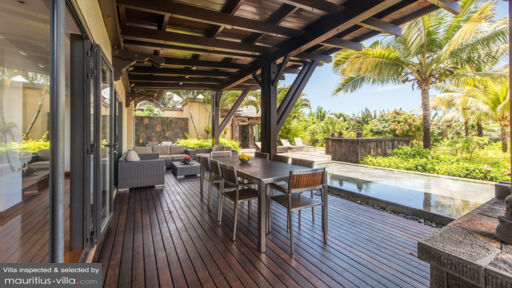 Situated in the south side of Mauritius, facing the sea, is Villa Solaya. 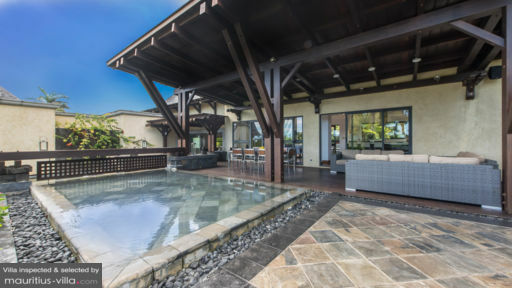 This villa is a five bedroom tropical haven with lush green surroundings and breathtaking views of the ocean and horizon. The combination of wooden furnishings and sleek modern interiors will make you feel like you are living in a private resort. With friendly staff and its proximity to the ocean, you, your family, and friends are sure to have a fun and relaxing holiday here at Villa Solaya. Here at Villa Solaya, you can enjoy having the company of your family and friends whilst having your own privacy as the villa is equipped with five bedrooms. Four of these rooms have comfortable double beds while one has a bunkbed. With their cosy interiors and wooden floorings, you are sure to get a restful night’s sleep in any one of these rooms. One of the rooms also has a TV, which is perfect for those mornings when you feel like lazing around in bed a little longer. Here at Villa Solaya, you will feel like you are living in paradise because of its lush and expansive garden area. The sight of the variety of shrubs, plants, and trees peppering the garden is sure to melt all your stress away. You can take long walks here and breathe in the fresh air. In the afternoons, you can cool off in the infinity pool that wraps around the villa. Here you will feel like you are swimming in a clear cool lake, as you float on your back, enjoying the blue sky above, and the peace of your surroundings. You can also soak the view of the ocean and horizon on one of the sun loungers by the pool. In the evenings, the soft lights and cool night air make for a romantic dinner setting. You can then take your meal in the outdoor dining area that comfortably seats up to eight people. Guests staying at Villa Solaya will find that the villa’s interiors help complement its soothing outdoor atmosphere. In the living room, you can relax on the large L shaped sofa while chatting with friends. Opening up onto the pool deck is the bright and modern fully equipped kitchen. It has an island with three stools where you can enjoy your breakfast. Everyone wants to come away from their holiday feeling like they had a restful and relaxing time. Here at Villa Solaya, the staff strive to give you such an experience. There is housekeeping and security service to ensure that your stay is comfortable. However, you can also hire a chef and personal guest assistant to help you during your stay. 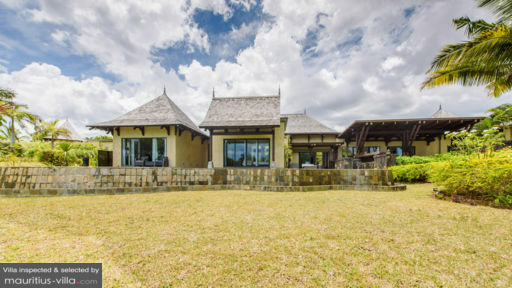 Villa Solaya is located on the south side of Mauritius, near the Bel Ombre area. The south side of the island is popular for its varied landscapes: from cliffs to bays, this side of the island is for those who want to explore more of what Mauritius’ natural wonders have to offer. Within the Bel Ombre area is Infinity Blue, a restaurant that serves Mediterranean cuisine, and the C Beach Club, a popular spot where both tourists and locals come to enjoy some nightlife. What a house! and surroundings! We have been 5 adults and 3 children here for a week. The house and the pool have been perfect for us. We have spent more time in the water than in the air. Camel and Ricardo have taken very good care of us. We have had unforgettable days and we will surely recommend this villa to others. A few small things: only one lights bub was working in the pool. A functioning electrical socket close to mirror in the rooms (for hair drying) would be good. Thank you! An absolutely beautiful location - our stay was most enjoyable and relaxing. We would certainly recommend a holiday here. Carmel greeted us each mornings with a warm friendly smile and went above her work. Thank you Carmel! We spent 2 incredible, magical, fairy weeks with friends in this beautiful house. Carmel and Ricardo, we thank you with all our hearts for your recommendation, your smile every morning and your kindness. We hope to come back soon! Thank you thank you thank you!